Left Las Vegas early in the morning. Melinda & Gail tried to talk me into staying a little longer. It's hard to leave when you've met people and made friends. Bob took me out for breakfast, then to the University of Las Vegas to show me where he uses the computers. He gave me his e-mail address to keep in contact. Then I headed out to Rachel, NV. 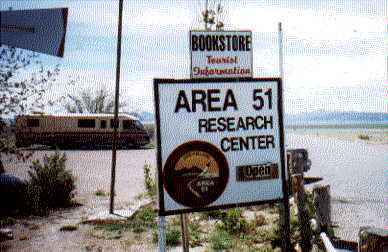 Found a free place to set up my tent--right between the Area 51 Research Center & the Little ALE'INN. There was one large RV. He was the only other visitor there. Talked him into driving with me up as close as we could go to Groom Lake. He reluctantly agreed. As we got closer to the fence, we could see the security guys sitting in their white trucks. That's as far as we dared to go. Later, after dark, a camper with 3 or 4 people arrived at the Little ALE'INN. A jet flew over with his after-burners on (I think that's what they are called) and huge flames came out of the back. He broke the sound barrier 3 times. By then, everyone was outside excited, looking upward, and "ooing & ahhing". It was fun. I think the air base might have been putting on a little show for Rachel. Everyone was enjoying themselves. People drive all the way out there hoping to see something--anything. 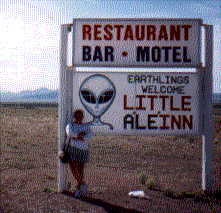 I used to say, "Someday I'm going to Rachel, NV and have my picture taken in front of the "Little ALE'INN" sign! Well, here I am! 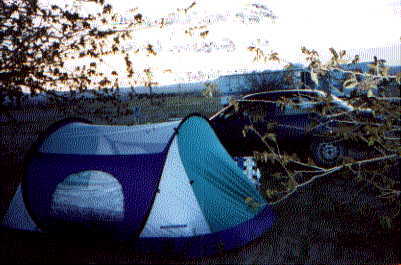 It was an excellent tent night. No wind. And it had cooled down nicely. I kept the rain cover off so I could look up from my cot and see the stars.